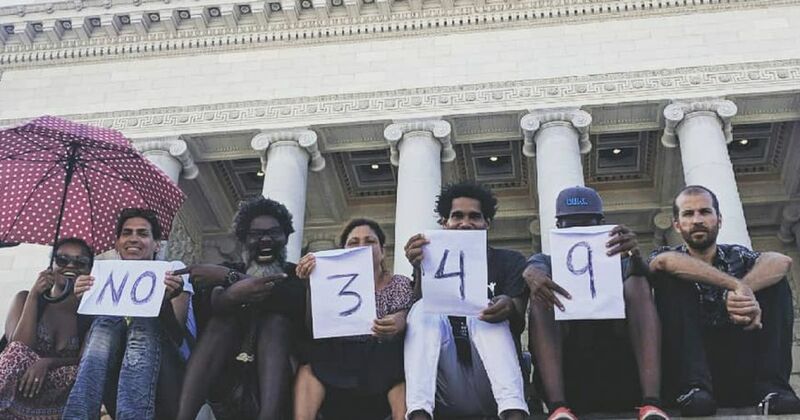 The XIII Biennial of Havana has been highly politicised and militarised, and that results in a volatile and unpredictable situation for us, due to of the offenses unleashed by Decree 349. State authorities exercise total control over independent institutions and initiatives, and threats are already circulating that they will expel so-called “undesirable artists” from biennial openings and events. The Museum of Politically Inconvenient Art (MAPI), united with the San Isidro Movement will carry out various strategic moves in order to test Decree 349 and raise questions about the Cuban regimes latest approaches to culture. To this end, we will launch the curatorial project Se USA (to use/USA) as part of Bienal Sin 349 (Biennial Without 349), a collective exhibition that will bring together all the art-related independent initiatives in Havana. Se USA will take place at the headquarters of MAPI and the Museum of Dissidence in Cuba, at Calle Damas 955 in Old Havana. We will bring together works by Cuban artists that have not been invited to the biennial. Most of them are neglected by state institutions and enjoy little visibility in the state-run media. They are artists who ask incisive and “politically incorrect” questions about LGTB rights, animal rights, and racial issues. Many among them are self-taught and lack opportunities to insert themselves in the art circuits that are managed by the state. Most of them participated in the #00Bienal of 2018. This exhibition will be carried out openly and publicly. We will use the same promotional strategies as other professional organisations use for their art events. Even though our exhibition may be censored because it is not officially sanctioned or because of the content of the works, we will make it public. We will post the list of participating artists and the schedule of special events on Facebook and also send press releases to various media outlets. We see this exhibition as a test for the regime to determine whether or not it will allow spaces for independent art to continue to operate. Any negative publicity aimed at denigrating the San Isidro Movement will be used as a promotional tool. Even bad publicity gives us visibility. Our projects question the Cuban state’s monopolistic control of culture and offer opportunities to reflect on the implications of Decree 349. In addition, the real position of the state authorities will be revealed by their actions towards us. If they do not intervene and the action is allowed, this will mean that cultural platforms capable of fostering and defending a decentralised model of culture, independent of state control, can be sustained. It will also demonstrate that independent art can wield political influence in Cuba and beyond. On the other hand, if the action is repressed, it will be evident to everyone that Decree 349 is indeed being used to censor art and repress artistic freedom. Such moves would contradict the official claim that this law is designed only to protect culture and that only by creating legal channels can self-taught artists achieve proper recognition. We will also organise panel discussions, performances in public spaces, thereby testing the Decree with a range of works that posit political questions directly. This effort will initiate our new Cultural Rights Observatory, a project designed to bring attention infringements by the state that are detrimental to Cuban culture.